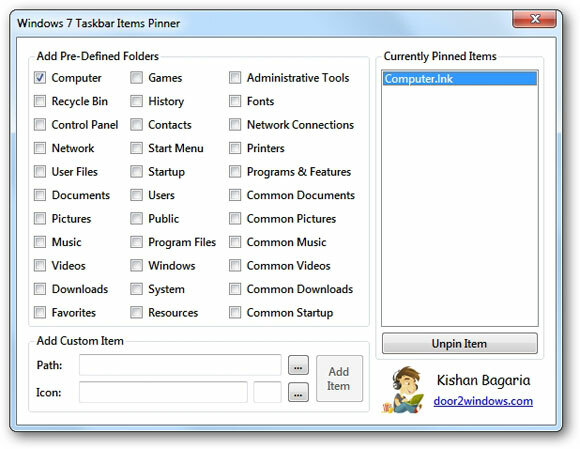 Windows 7 Taskbar Items Pinner is a freeware from door2windows that allows you to pin files, folders & web pages to your Windows 7 taskbar. Normally, the Pin to Taskbar option only works with EXE files but this tool enables you to pin any file of any extension, any folder & even web pages. Just run the tool, and select the pre-defined items that you want to pin. It will pin them instantly. Click on the button near Path and select File if you want to pin a file or select Folder if you want to pin a folder. Click on the button near Icon and select the icon of the file or folder. If you want to change the icon no, just type your desired icon no in the textbox before the button. Type the full path of the webpage in the textbox near Path. It will now pin the webpage.